I recently purchased this old rusty shovel with a broken handle for 50 cents at a garage sale. 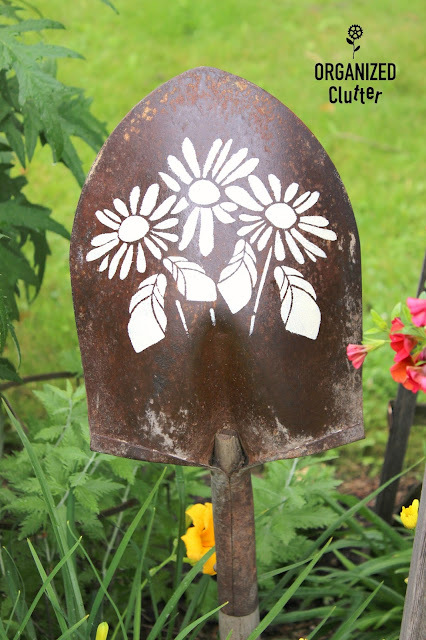 I was in luck that a new stencil I had purchased from Folkart called the "Lazy Daisy" fit pretty well on the back of my shovel head. First, I sprayed some Krud Kutter on the back of the shovel to remove dirt and crud. Next, I taped the stencil onto the back of the shovel with painters tape. I used Ceramcoat Select Acylic Paint in Ivory for my stencil paint. This paint is much better for outside signs and projects and I use it a lot for stenciling on glass too. After it cures, it is much more durable. You can make the paint even more durable with a couple of coats of Krylon Satin Spray Sealer. I think it may slow down the rusting of the shovel head as well. I sawed the shovel handle off evenly and drilled a hole in the bottom to stick a 3/16" steel rod inside. Make the hole almost the same size as the rod so it's snug. This metal rod will stick in the dirt like a stake. The last step was to stick my new piece of garden art in the garden! I had a hole in my flower border among the taller flowers. This will fill in the space nicely. More garden shovel projects I have made. "Grow" and "Bloom" from chalk transfer method and a white paint pen. My "Happy Fall" shovel head sign. 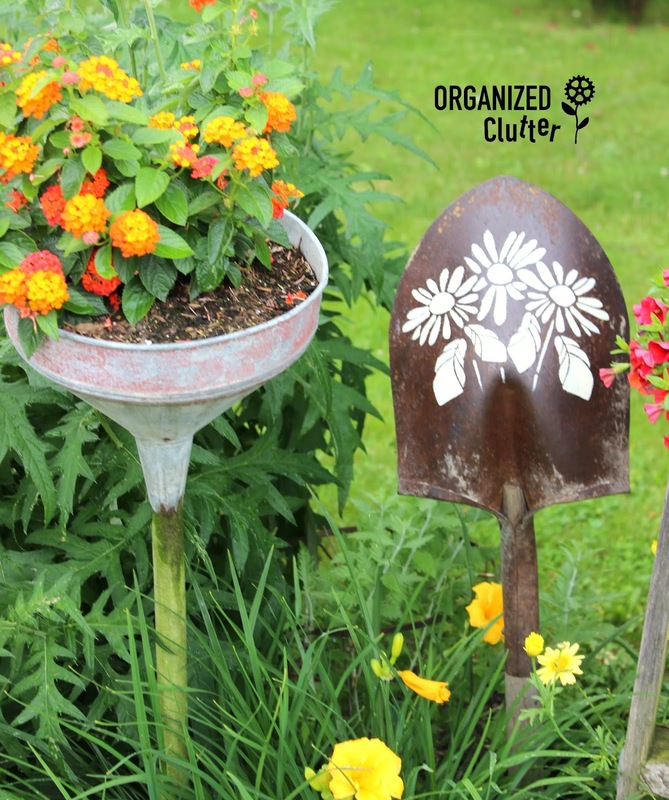 Shovels make great garden junk art! wish you lived closer...I'd get some flower lessons! 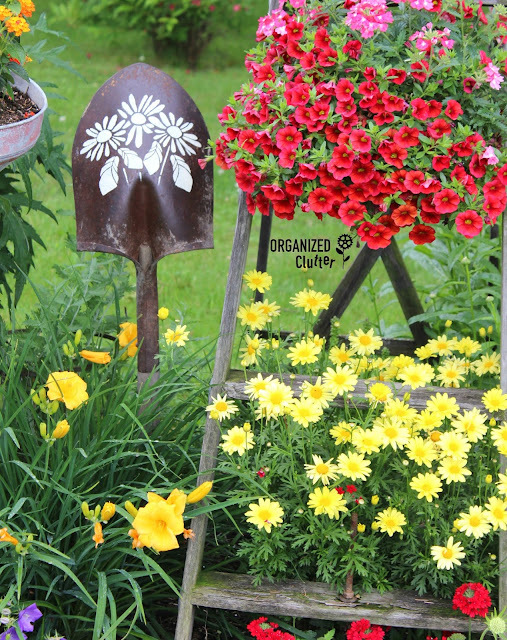 Just love how you mix the rustic with the pretty flowers. Such great ideas! Where do you get the steel rods for stakes? 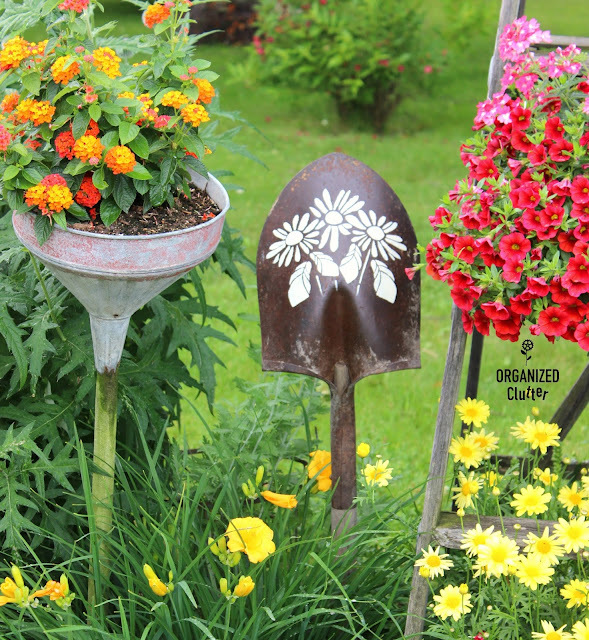 Great idea - I love this and I have two old shovels sitting in planters - Love this! This is a piece of art! I love the idea! I just scored a bucket of old rusty shovel heads so I'm definitely pinning this idea!